(Reuters) - A U.S. military F-35B fighter jet crashed near the Marine Corps Air Station Beaufort in South Carolina on Friday, for reasons that are under investigation, local law officials and the U.S. military said. The pilot, the only person aboard the craft, ejected safely and was being checked for injuries, said a Pentagon spokesman, adding that there were no other injuries. The jet crashed just before noon local time. It was a Lockheed Martin F-35B, a short take-off/vertical landing version of the F-35, said a U.S. military official, speaking on condition of anonymity. It was the first crash of an F-35 fighter jet since they became operational in 2006, said another military official, also speaking on the condition of anonymity. Friday's incident also marked the first time a pilot had ejected from an F-35B, the official said. Neither military nor local officials immediately offered a cause for the crash. Military officials said the crash was under investigation. Lockheed referred Reuters to the military for comment on the incident. The F-35B stealth fighter jet was used by the United States in combat this week for the first time, against the Taliban in Afghanistan, after taking off from an amphibious assault ship in the Arabian Sea. Israel in May was the first country to use the F-35 stealth fighter in combat. The crash came on the same day that the Pentagon announced an $11.5 billion contract for 141 F-35 fighter jets from Lockheed, which lowers the price for the most common version of the stealthy jet by 5.4 percent. 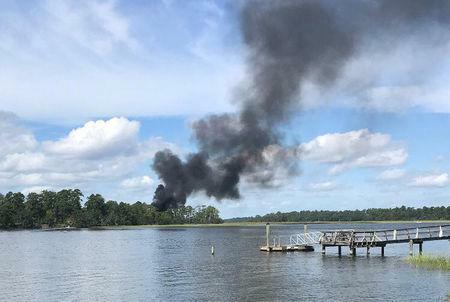 The plane in the South Carolina crash was one of 245 F-35 fighter jets in the U.S. military, a Pentagon official said, and one of a total of 320 F-35 jets being flown around the world. Under the new contract signed on Friday, the next deliveries of F-35B jets will cost about $115 million each, military officials told Reuters. The F-35B is the most expensive of three variants of the F-35, which also include the F-35A conventional take-off and landing version, and the F-35C, used aboard aircraft carriers. Lockheed is the No. 1 U.S. defense contractor.